Commonly found in Myanmar's jungles are tigers and leopards. In Upper Myanmar's highlands, the elephant, rhinoceros, wild buffalo, wild boar can be found as well as many species of deer and antelope. As forests cover over 40 percent of Myanmar, it's not surprising there are animals that live and thrive in them. Myanmar has over half of the remaining closed-canopy forest in mainland Southeast Asia. 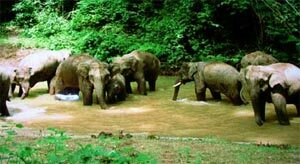 Having a wide range of habitats and ecosystems, it has one of the highest biodiversity values in Asia. The large undisturbed forested patches in Myanmar are important for the survival of several endangered species including tiger, elephant and Eld’s deer. The long, vast green contour of Bago mountain range, with its north-south hills, covered with dense tropical forests, extending for 270 miles (435km) between Ayerwaddy & Sittaung Rivers at the average elevation of 2,000ft (600m) in the central-southern part of Myanmar, boasts many of major timber extraction sites, producing the world’s most treasured Teak (Tectona grandis) and other valuable hardwoods. Adventure Silk Road Inc offering incredible outdoor adventure vacations in Myanmar such as Myanmar safari vacations and wilderness safari tours in Myanmar ... all searchable by location. We have a collection of the finest safari vacations in Myanmar. All of the safari operators represented here have active Myanmar safari tours to fit all abilities and interest levels. Begin your search for Myanmar safari vacations or wilderness safari tours in Myanmar by selecting one of the safari operators below. We recommend you study our list of Myanmar wildlife safaris, narrow your selection to 2 or 3, and contact the respective tour operators for more detailed information. Some of Myanmar's smaller animals make the forests (trees) their home, one such animal is the gibbon, which is a small species of ape that lives in trees. Other small animals to be found in Myanmar are several monkey species, the flying fox, the wildcat and the tapir. Some of the common reptiles in Myanmar include the crocodiles, pythons, cobras, geckos and turtles. Bird varieties are many as well, with the exotic parrot being among them. Other birds found include crows, pheasants, peafowl and paddybirds.